UK experts say they may have found a way to check for Alzheimer's years before symptoms appear. A lumbar puncture test combined with a brain scan can identify patients with early tell-tale signs of dementia, they believe. Ultimately, doctors could use this to select patients to try out drugs that may slow or halt the disease. Currently there is no single test or cure for dementia, a condition that affects over 800,000 people in the UK. Experts are working hard to find treatments that prevent the disease or at least slow its progression. Although there are many candidate drugs and vaccines in the pipeline, it is hard for doctors to test how well these work because dementia is usually diagnosed only once the disease is more advanced. Dr Jonathan Schott and colleagues at the Institute of Neurology, University College of London, believe they can now detect the most common form of dementia - Alzheimer's disease - at its earliest stage, many years before symptoms appear. Their approach checks for two things - shrinkage of the brain and lower than normal levels of a protein, called amyloid, in the cerebrospinal fluid (CSF) that bathes the brain and spinal cord. Experts already know that in Alzheimer's there is loss of brain volume and an unusual build up of amyloid in the brain, meaning less amyloid in the CSF. Dr Schott's team reasoned that looking for these changes might offer a way of detecting the condition long before than is currently possible. To confirm this, they recruited 105 healthy volunteers to undergo a series of checks. The volunteers had lumbar puncture tests to check their CSF for levels of amyloid and MRI brain scans to calculate brain shrinkage. The results, published in Annals of Neurology, revealed that the brains of those normal individuals with low CSF levels of amyloid (38% of the group), shrank twice as quickly as the other group. They were also five times more likely to possess the APOE4 risk gene and had higher levels of another culprit Alzheimer's protein, tau. Although it is too soon to know if any of the volunteers will go on to develop Alzheimer's, the researchers believe their suspicions will be confirmed in the future. Crucially, it would allow doctors to test which drugs might be beneficial in delaying or preventing dementia. And for those who might be put off such screening by the need for a lumbar puncture, which involves drawing off fluid from around the spinal cord with a needle, experts are looking at whether a different type of brain scan might instead be used to detect amyloid. Rebecca Wood of the Alzheimer's Research Trust, the charity that sponsored the work, said: "We are hamstrung by our inability to accurately detect Alzheimer's, but these findings could prove to be pivotal. "We know that treatments for many diseases can be more successful if given early and this is likely to be true for Alzheimer's." 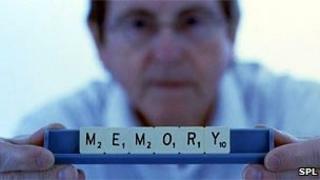 Dr Anne Corbett of the Alzheimer's Society said: "Detecting dementia early is really important. It can open doors to new treatment targets and could one day go hand in hand with an Alzheimer's vaccine that scientists are edging slowly towards. "Testing spinal fluid is a good way of detecting Alzheimer's early but it is desperately under used in the UK. "If we change our attitudes and invest more in research we could give hope to the million people who will develop dementia in the next 10 years. We particularly want to see this research repeated over a longer period of time to confirm the findings." Alzheimer's disease is the most common cause of dementia, affecting around 465,000 people in the UK. What is delaying a cure for Alzheimer's?